We are torching our own country annually. While climate change has exacerbated fire season, researchers haven’t really studied how many of those fires are our own damn faults until recently. The answer is most of them—84 percent. A team of American scientists reviewed a million and a half government records on the wildfires that states needed to put out between 1992 and 2012. 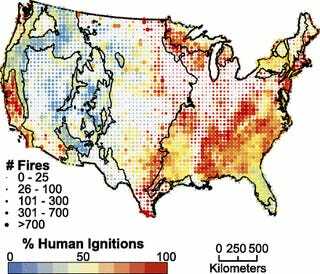 Humans were responsible for almost 1.25 million wildfires, while lightning was only responsible for the remaining 250,000. Human-burned area amounted for a little less than half of the total burned area, though, since lightning-caused fires generally happen in the wilderness and burn out on their own, according to ClimateCentral. “The role that humans play in starting these fires and the direct role of human-ignitions on recent increases in wildfire activity have been overlooked in public and scientific discourse,” the scientists write in a paper published in the Proceedings of the National Academy of Sciences today. It’s often difficult to attribute fires to human activity or lightning. The researchers took their data from the US Forest Service Fire Program Analysis-Fire Occurrence Database—and the causes of the fires were unsurprising: “equipment use, smoking, campfire, railroad, arson, debris burning, children, fireworks, power line, structure, and miscellaneous fires.” Arson and lightning accounted for the same number of fires, according to ClimateCentral.org’s reporting. 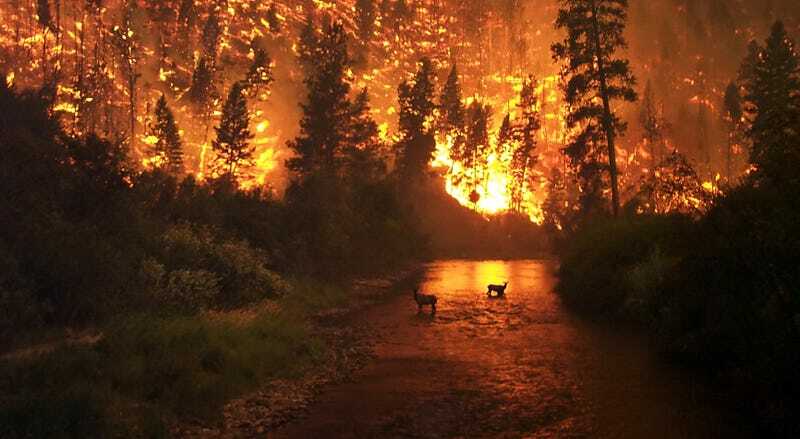 Think about that: humans set as many criminal fires as nature would have lit alone. And things have been really bad. Four of the worst fire seasons since 1960 have happened in the past ten years, with over ten million acres set ablaze in 2015, according to a paper published by wildfire experts back in 2015. This past year saw flames destroying 80,000 acres and killing 14 in the Southeastern United States, and those fires were set by a couple of kids. Fire destruction amounted to around two billion dollars worth of destruction in 2016. Wildfires are actually necessary for the environment. Trees in the Northeast’s pine barrens require fires to produce their seeds, for example, according to Timothy Mihuc, a professor of environmental science at SUNY Plattsburg in New York. Except now there are far more human-caused wildfires than lightning-caused wildfires, and in areas with higher populations. And to briefly mention climate change, fires can release tons more carbon into the atmosphere and can make fire seasons worse. So, guys, put out your campfires, don’t toss your cigarette butts into piles of kindling, don’t set your neighbors’ lawns on fire, et cetera. Only we can prevent forest fires, because mainly we have been starting them.